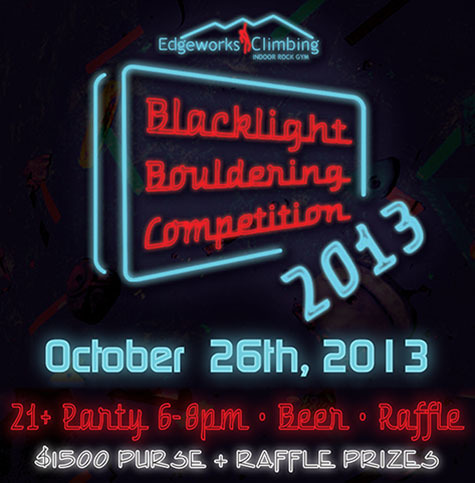 The Blacklight Comp features awesome routes, $1500 cash prize, gear from awesome companies, and an afterhours party. Come hang out with the Puget Sound climbing community. Here’s your chance. Join our USAC Certified Routesetter Mike Dove for an evening of pure routesetting joy on October 13th. ...READ MORE College Night at Edgeworks just got better than ever! The 2nd Saturday of every month… $5 passes. ...READ MORE Starting October 1st, 2013 we will be rolling out a new fall fitness schedule. Check out our schedule to see new and updated classes! ...READ MORE Congratulations to the team kids who crushed it this past weekend...taking home 4 of 6 ribbons in the Female Youth D division!